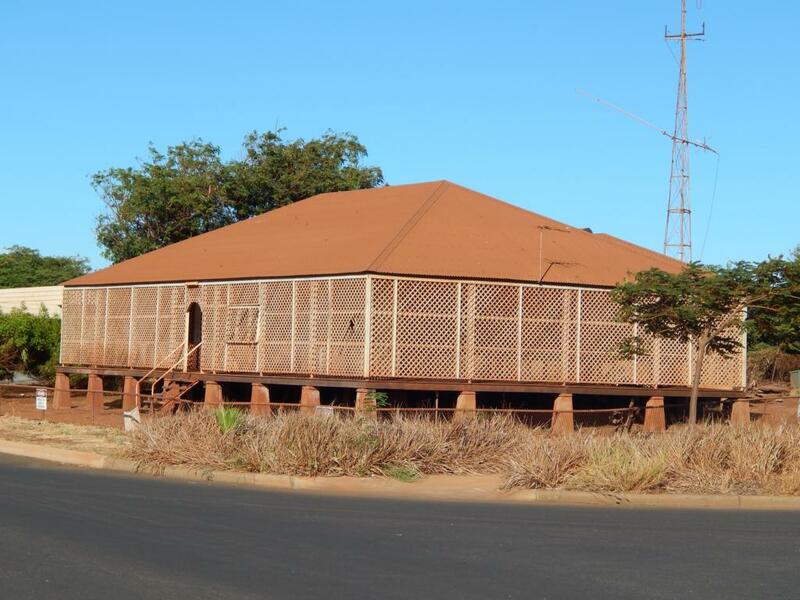 After we have been looking for work so long we got a job offered in Katherine, which is about 300km southern from Darwin. So we drove a bit of our way back and started working for the Royal Australian Air Force as kitchenhands and stuards. Not the most exiting job but good payed for not too much work! I recon one of the best things about this job was that we both were the only guys in the whole hostel, who were working in an air-conditioned place! 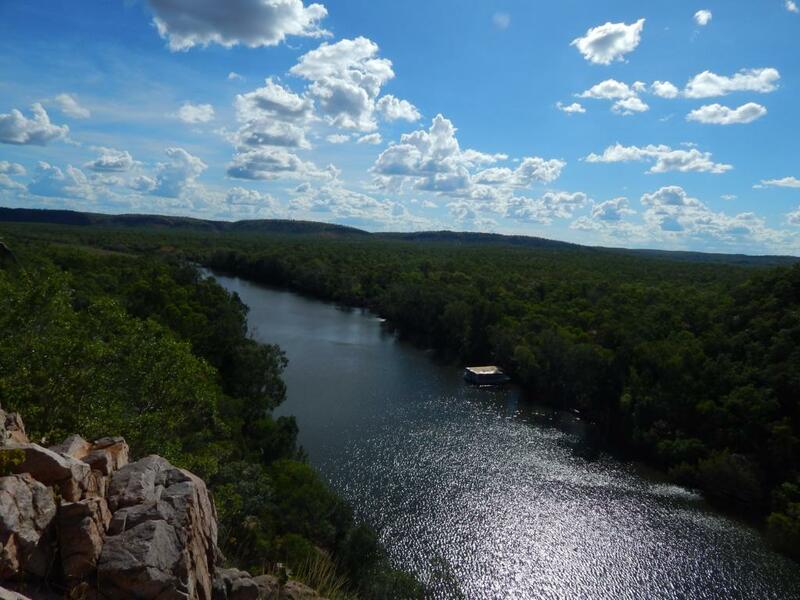 On the pictures above is from one of our weekend trips up there to Katherine George. Beautiful landscape, but bloody hot everywhere!! Here you see another weekend activity of ours: relaxing in the pool! Very good times, especially we met two guys from Hamburg again. 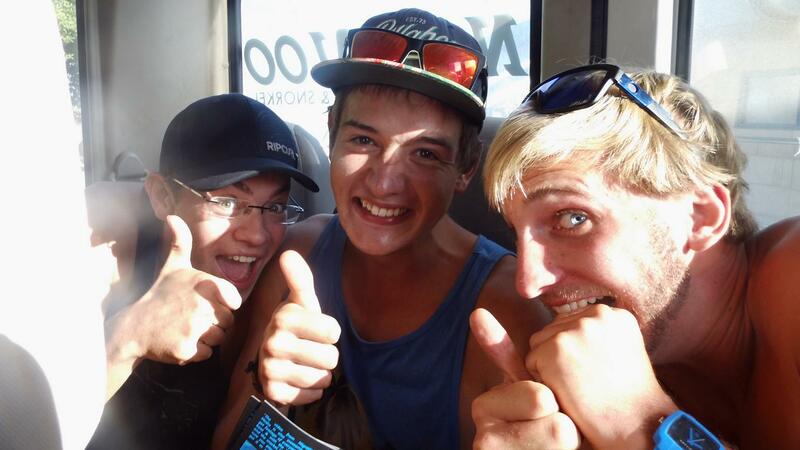 We met them at first in Mount Isa on a campground in the middle of the outback and now they stayed in the same hostel as we did, just two rooms next to ours. We had a lot of fun weekends together.. crazy stories after all :-D So we decided to travel a bit together on the west coast. 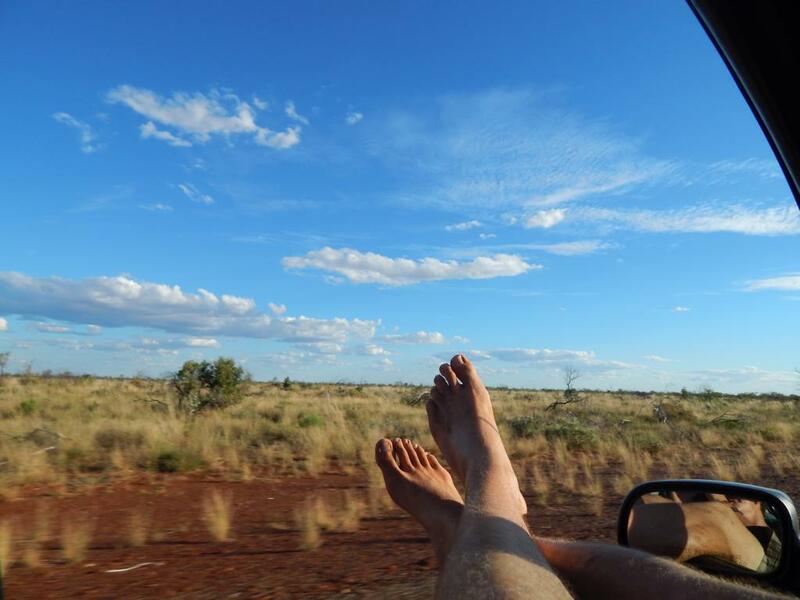 But at first Simon and me kept on travelling a bit alone after we finished our Air Force job because we wanted to see a bit of Litchfield National Park. 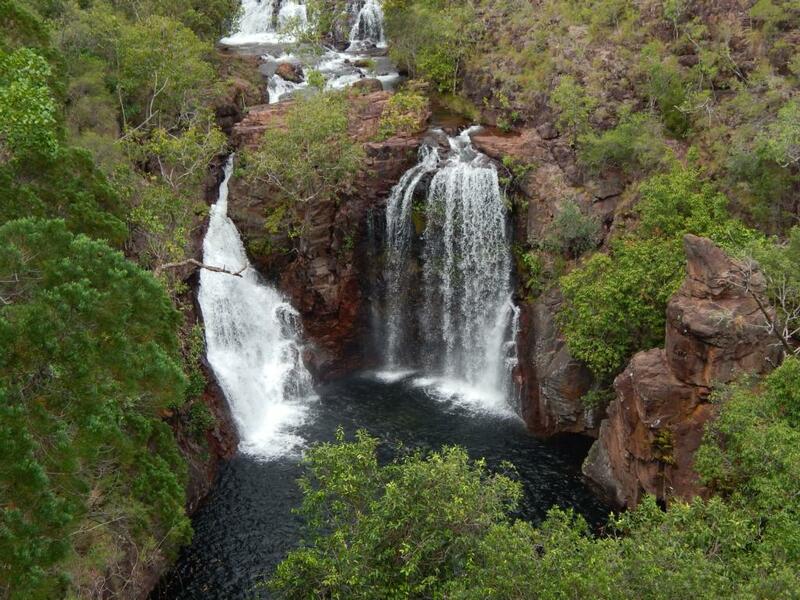 So after nearly five weeks in Katherine we started our next roadtrip, first stop some waterfalls near Katherine..
Yeah, after an afternoon of nice refreshment and a biiiiiggg piss, we kept on moving north. 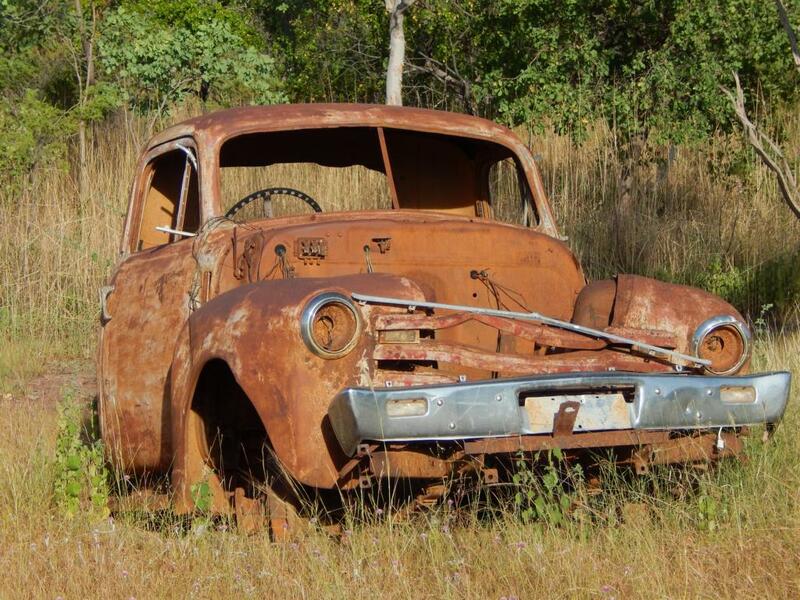 Here you see an pretty old car, like you find them tipically all along the highways in the outback. I´m still very happy we didn´t end up like this!! 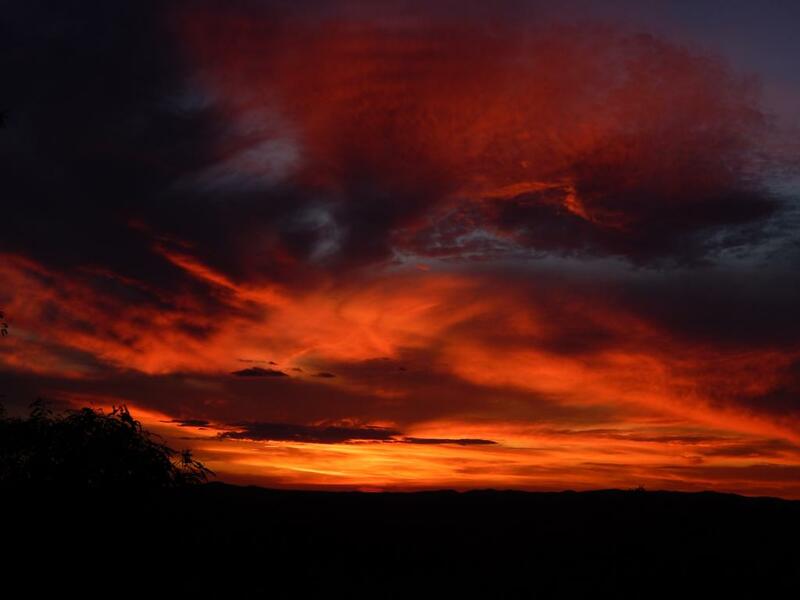 Outback sunset… So beautiful!! 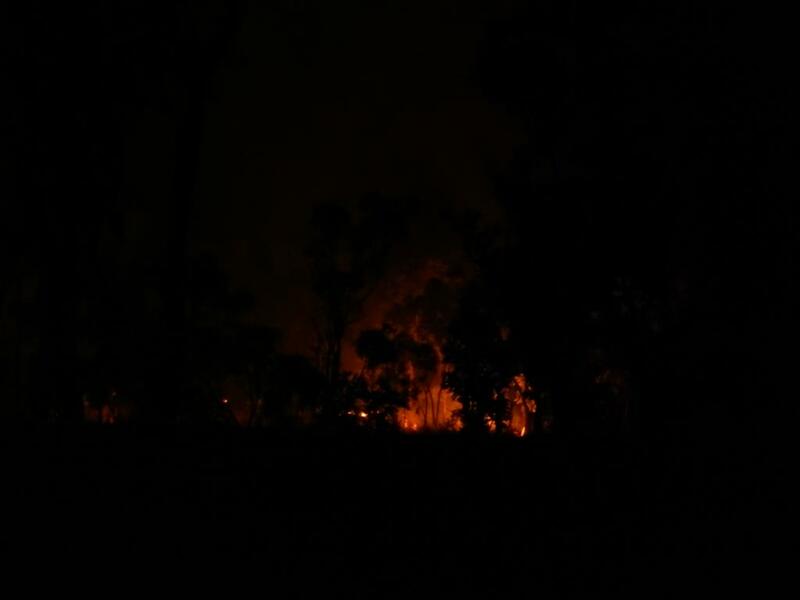 What a nice day at the waterfalls, so we went further up and passed our first bushfire. It doesn´t look too frightening on the picture but we were not too sure at first how dangerous it can really get, but when we passed the same stop the next evening again it was already gone. Finally in Litchfield. 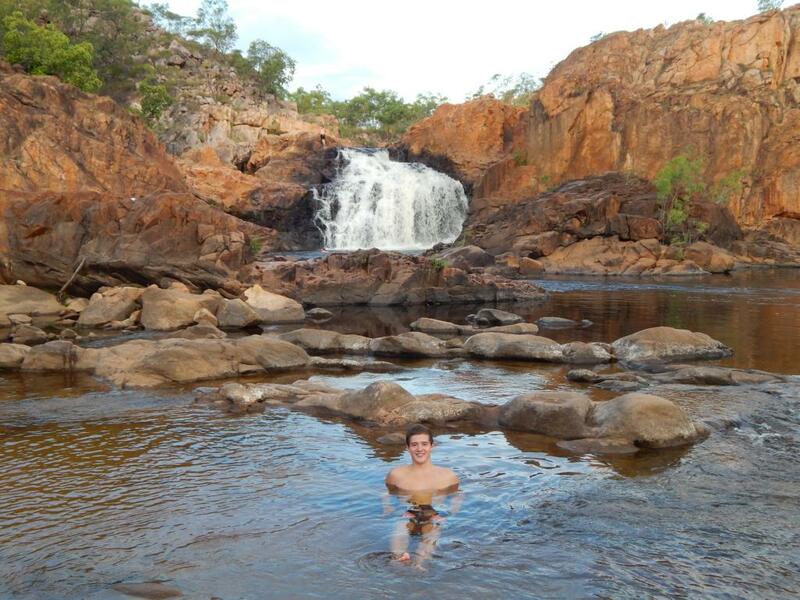 After half a night of driving and a night under the stars in the National Park we went for some nice swims in here! 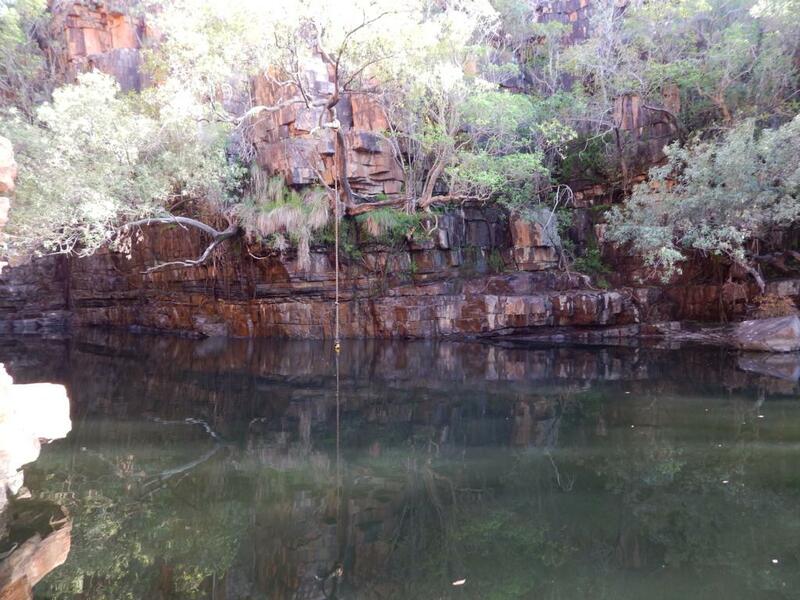 There are a couple of great spots in Litchfield, like the rockpools and very clear and kind of cold creeks. The same night we headed off towards westcoast! We drove all night long and arrived the next morning in this place: the grotto. 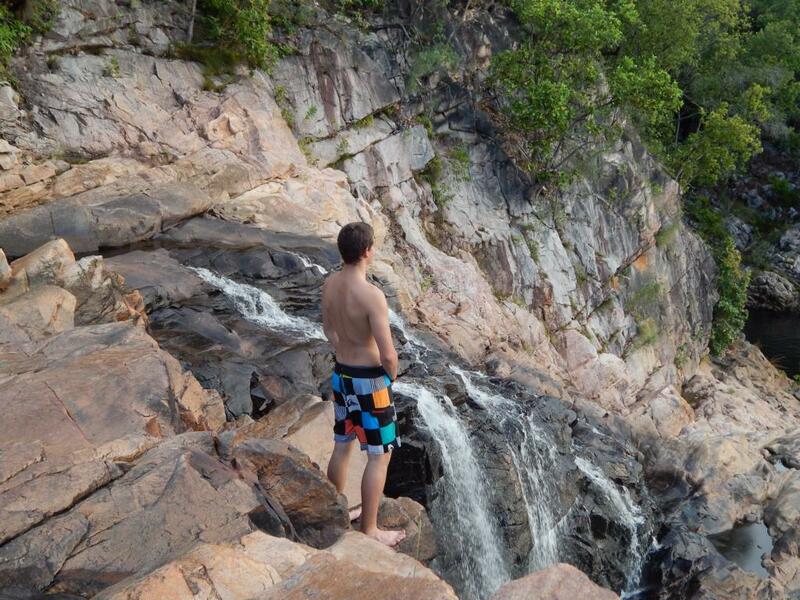 A great swimmingspot in a canyon in the middle of nowhere.. 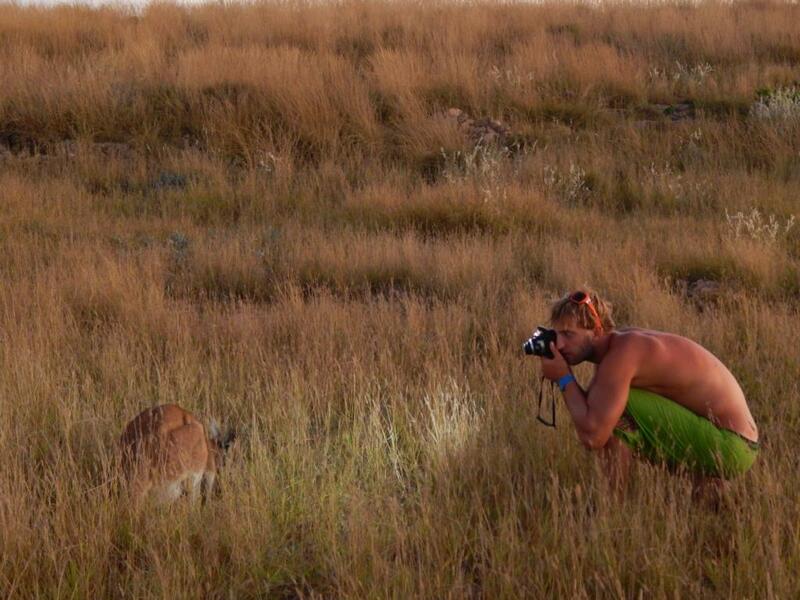 The same evening we made the about 1600km from Litchfield to Broome and met our Hamburger mates again. 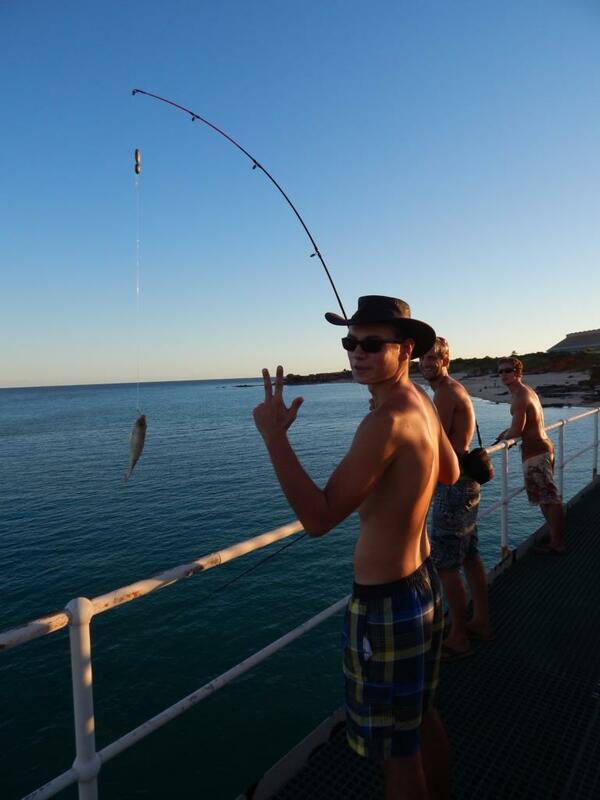 We had a good time in Broome, did a fair bit of fishing, caught some Queenfish and enjoyed paradise on the beach. 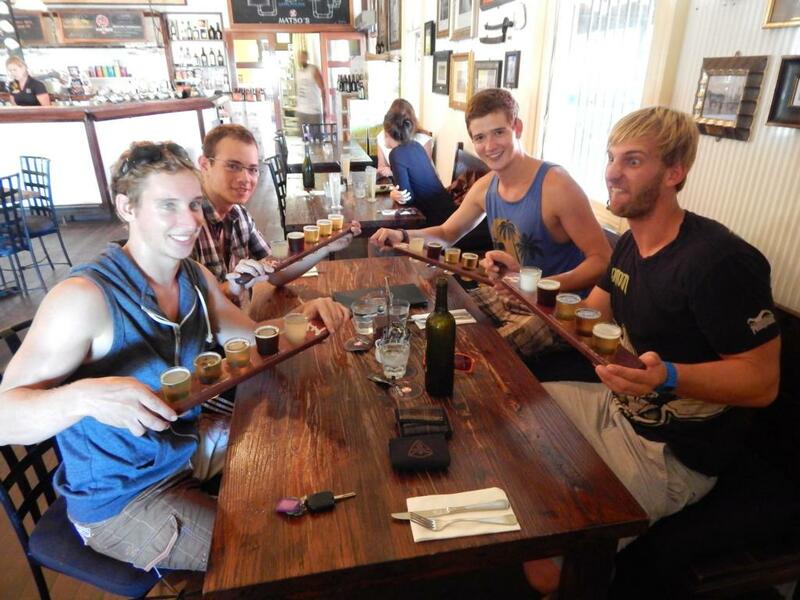 We also visited a micro brewery in Broome and tasted some very interesting beers, like ginger beer, some smoky stuff and so one. Very “special” stuff but good fun with the right people! After a couple of days in Broome we kept on driving but now with two cars, always looking for a nice quiet place on the beach. Poor backpacker brekky :-D The ambient just can´t be better for a breakfast but sitting under some palm trees next to the beach! 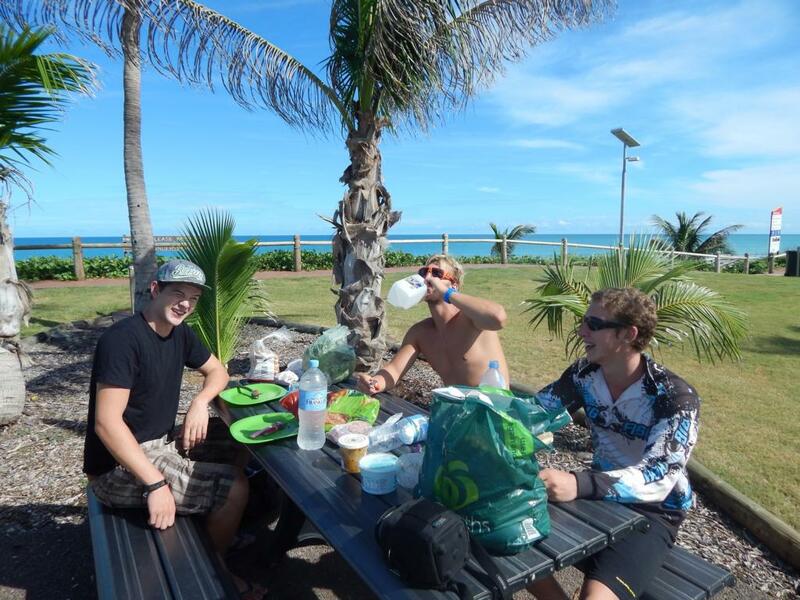 Finally we found a park where we could camp on the beach, go swimming, fishing, snorking.. right next to 80mile beach! And yes we bought us some new toys during our stay in Broome: spears! 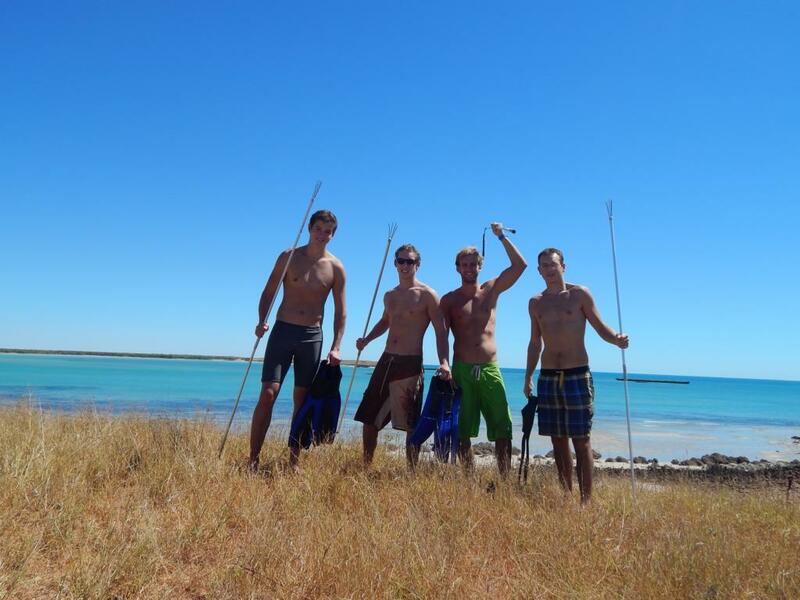 So we went for some spearfishing, which was harder after all than expected! But like you see on the picture underneath, we became successful after a bit of training! 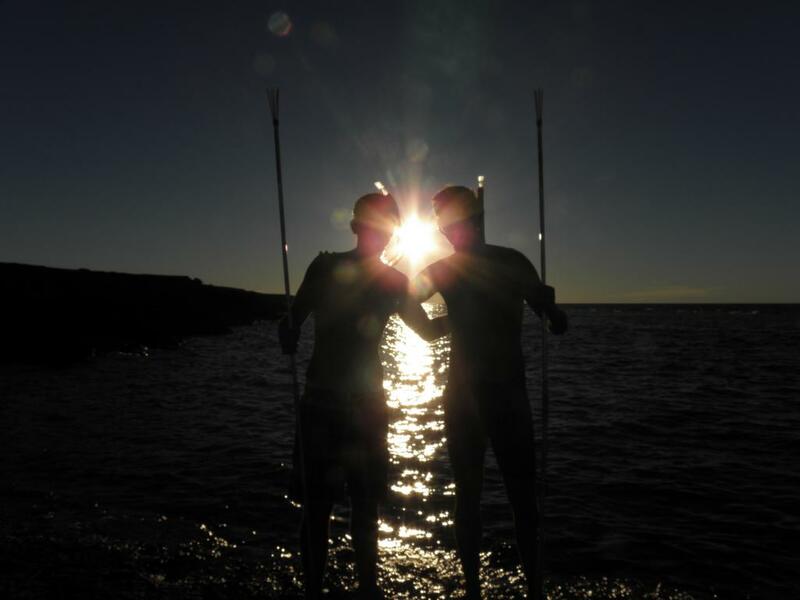 Simon and me after a day of fishing and swimming, unbelievable times! 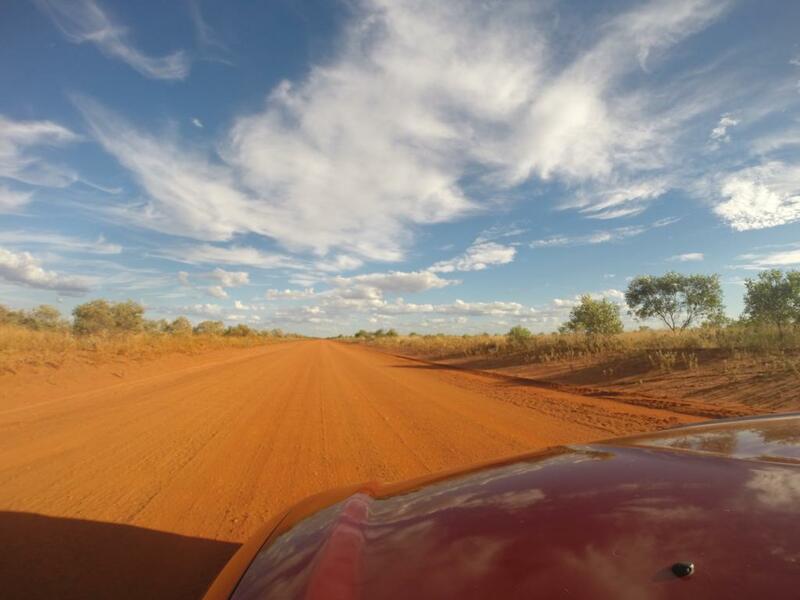 The roads through the park, just like you would imagine an outback dirt road: red sand everywhere and bloody hot! 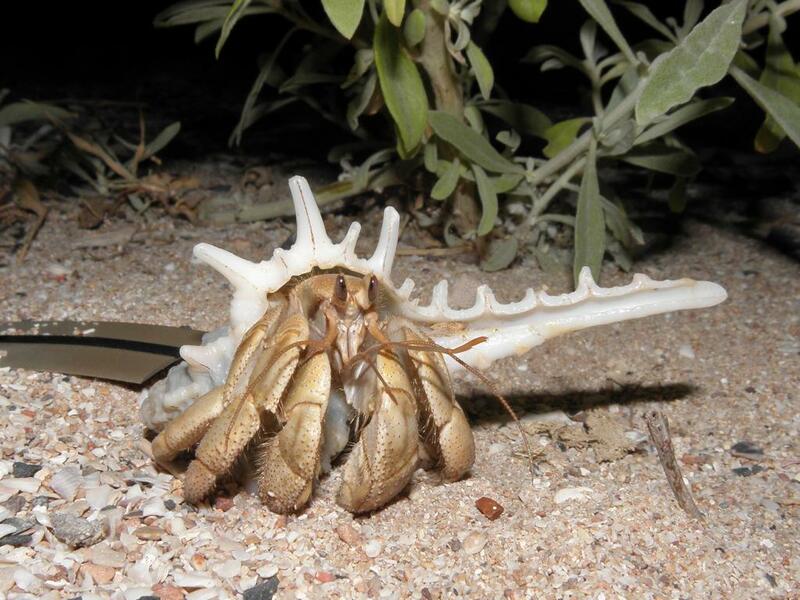 We met a lot of interesting animals, too, like Kangaroos, big fish, like sharks, dangerous ones, like fire fish and also tasty ones, like muddcrabs, which we caught with our speers as well. After we got a tire on our mates car fixed we kept on moving towards Karrijini – about 800km inland. Some nice waterfalls and waterholes down there, too, but we were a bit disappointed because the roads in this park were that bad, that we were only able to visit half of the nice spots.. 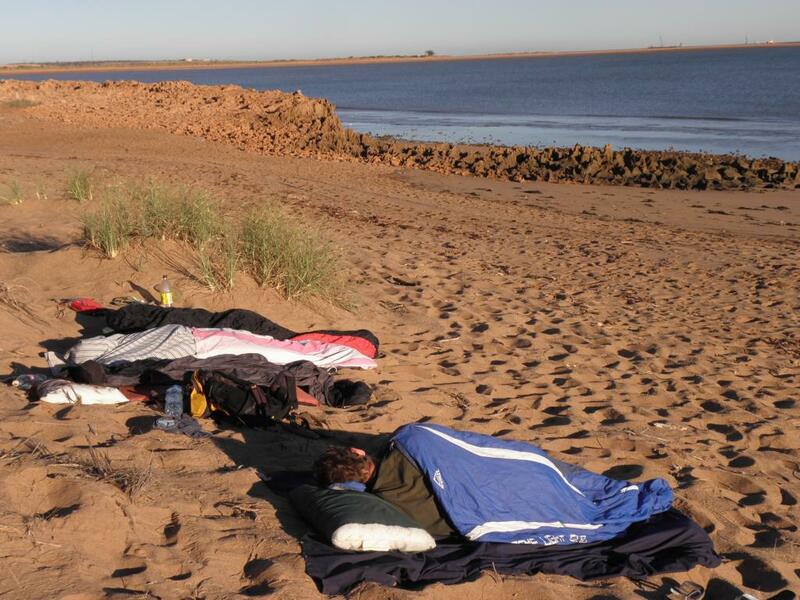 Anyway, we camped there for a couple of nights and made all our way to Exmouth. On the way we hit a small kangaroo but we were lucky – no bigger damage! 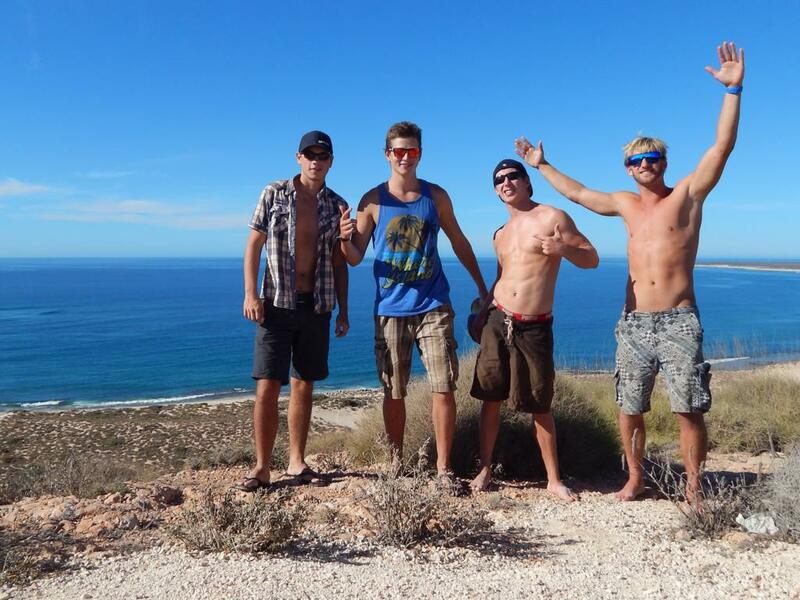 Up there we went for some nice snorkeling as well and got ready for our whaleshark dive the next day in coral bay! Here you see us at the lighthouse near Exmouth with a nice view all over the coastline. 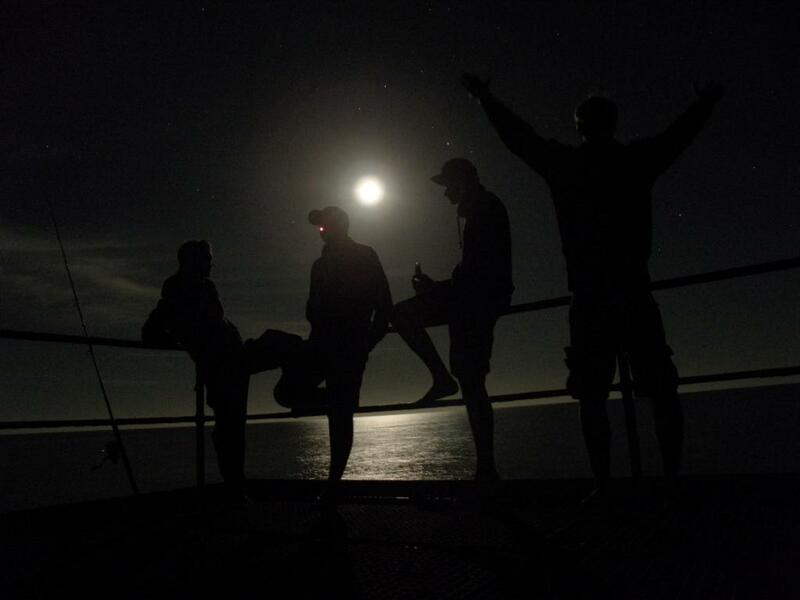 Nightfishing on a jetty between Exmouth and Coral Bay. What a great night! We only caught a couple of small squids this night but the ambient was breathtaking, especially with this nice moon. And besides all that it was just soo nice to have a temperature to feel cozy in a jumper! 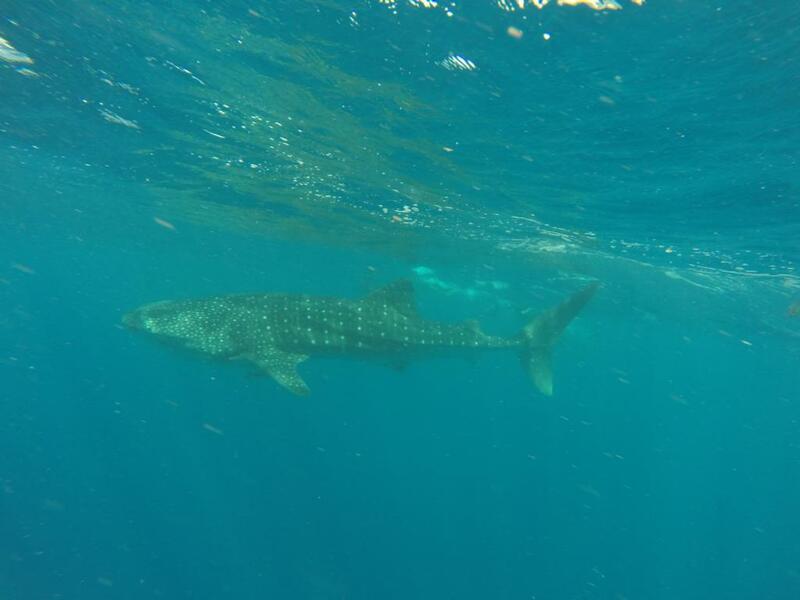 Whalesharken in Coral Bay – Shakabraaa—we are soooo exited :-D Such good fun to travel with Jip and Jens, this is our last day and adventure together for this stay in Australia. 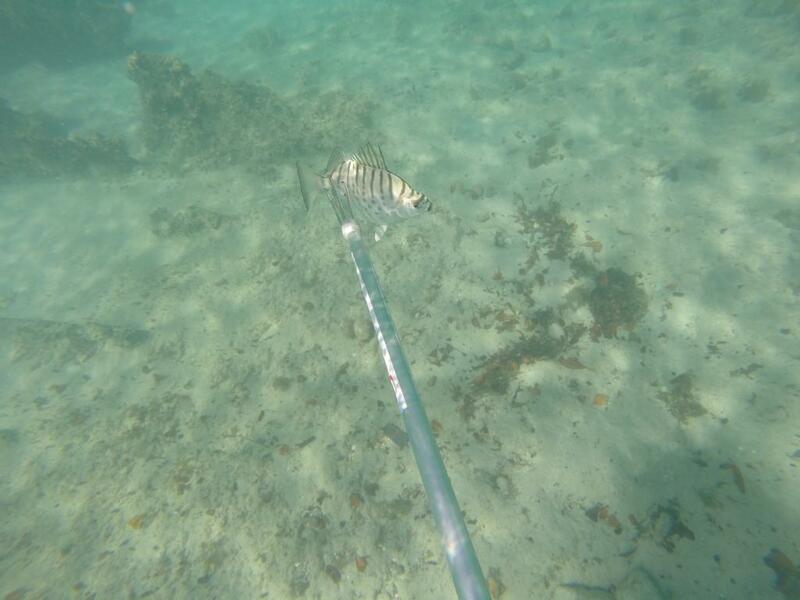 What an breathtaking experience to see a fish which was at least 7 to 8 meters long. Just unbelievable! Okay, we had to drive a fair bit (like 30km) off shore and I got seasick as f*** but it really was forth it. After Coral Bay Simon and me drove pretty quickly down to Perth to enjoy the city for a while and relax before our real big drive started: 2900km from Perth to Adelaide! !